George: Of course not! God forbid you should lose your status as a cult failure! When the AFI announced their Top 100 comedies last year, I'm sure I am not the only one to notice that the top two honors went to films about that all-American subject, cross-dressing. This might seem funny, but did you know that 1 in 40 men in this country do it? That's the statistic. Look around your office; imagine your graduating class. On a recent episode of The West Wing, Press Secretary C.J. Cregg (Allison Janney) suggested, statistically, that one of our presidents might have danced around the Oval office in a prom dress. Ponder that. Having just reviewed the AFI's #1 pick, the Billy Wilder transgender classic, Some Like It Hot, I now have their runner-up before me, Tootsie. While I have high praise for the sharp dialogue and many of the performances in this film, I admit I am at a loss to imagine how it grabbed the #2 spot: there are other comedies burned to film in the last 100 years that are more deserving. Nonetheless, Tootsie stands as a farcical study of how men treat women and how women treat themselves—a timely topic in 1982. Dustin Hoffman is Michael Dorsey, an uncompromising method actor whose bullheaded oblige to his craft tags him unbearable to work with. This pivotal information is succinctly imparted during the opening credits, so that when the action starts, we already know our man. This well-honed actor is "unemployed," which means, he is a waiter. His roommate, Jeff (Murray) is a struggling playwright (read: also a waiter). Michael leads actors workshops and tries to help his neurotic friend, Sandy (Garr), find the courage to audition for a role as a hospital administrator in a popular soap opera. She fails, but after his agent (played by the film's director) basically tells him he'll "never work in this town again," he decides he WILL, and auditions for the role...as a woman...himself. Through sheer persistence Michael—now "Dorothy Michaels"—lands the role. His sassy, no-nonsense persona becomes an icon for women everywhere, as "Dorothy" pushes her independent, career-oriented character toward heights that were only the dream of the feminist movement back then. Her popularity soars, the soap's ratings skyrocket, and Michael Dorsey is a working actor in the role of a lifetime. Meanwhile, he is, alas, a man, and cuts a typically insensitive path of emotional destruction in his wake. Unable to tell the confidence-challenged Sandy that he got the role she missed, he goes so far as to sleep with her to hide the truth. Bad manners. Then, he falls in love with one of his costars, Julie (Lange), but as he cannot reveal himself to her, he wins her confidence with his "motherly" attentions. And if that's not enough, as "Dorothy" he wins the affections of Julie's father (Durning), as well as the lust of the soap's aging womanizer (Gaynes). While all of these situations make for some very funny moments, watching it again almost 20 years later, I have to admit it just doesn't carry me as far as it did originally. The idea that it takes a caricature of a woman to kick-start feminist evolution comes within a whisker's-breadth of insulting. The concept of a man who experiences firsthand how women are subjected to certain pressures from men, all the while betraying the women in his life, is just too twisted. The movie begins to lose its edge, oddly just as the story revs up—about the time Michael leaves his agent's office. Hoffman captures the genteel mannerisms of his alter-ego's forthright southern charm and although not exactly believable, somehow we accept that others believe him. Hoffman has the opportunity to do all the things he does best, all at once, playing a difficult actor who in turns plays a difficult actress, balancing his self-absorbed masculine side with a more demure feminine side. You won't forget his nuances too soon. But just how much has his character changed in the end? Bill Murray does his usual deadpan screen character and Jessica Lange is all her role asks her to be: sweet and feminine and mildly insipid. Durning finds himself the hapless fool, parallel with Joe E. Brown's character in Some Like It Hot, but he does not share Brown's laissez-faire when he discovers he's been had. However, he is surprisingly tender, even in the end, and contributes to the overall credibility of the farce. Geena Davis fans will enjoy her screen debut...in her underwear. The call-out blurb belongs to Teri Garr. In some ways, she fits so well into the roles she plays that she seems to meld with the general architecture and one tends to remember her character more than Garr herself. Think of Richard Dreyfuss' wife in Close Encounters of the Third Kind; Gene Hackman's girlfriend in The Conversation; then remember her hilarious Inga in Young Frankenstein. Garr is that reliable second violinist who has played with everybody but never takes the spotlight. She is worth a closer look; what she achieves takes great skill. In the end, we have a lightweight romantic comedy masquerading as social commentary. Again, while the premise is dubious, what matters is that the characters convince us that they are convinced, so in the end, Tootsie is successful. But—the runner-up comedy of cinema's first century? Does a tomato have logic? Image Transfer Review: Columbia Tristar presents Tootsie in anamorphic widescreen (2.35:1), as well as offering a full screen, pan&scan version on the flip side. The film uses a very natural sort of lighting, and the palette holds a level just above mid-range, which seems to have transferred well. Fleshtones are very realistic. There is evidence of edge enhancement, most notably in bright interior scenes, but not enough to detract from the overall enjoyment of a very clean image. Your guess is as good as mine. This curious exchange occurs when Michael comes (quasi) clean and tells Sandy he is in love with another woman. I assume it's some bizarre editing artifact overlooked when cleaning up the language for a PG rating. This tidbit aside, Columbia includes a 5.1 mix as well as the original mono; I'm not sure why. Both are extremely flat, and I never detected any activity outside the front channels, even during the montage sequence when the Tootsie theme song plays. The French mono track is worth taking for a spin—the dub for "Dorothy's" voice is an excellent match! Extras Review: A rather thin set of features for this obviously popular comedy leads one to wonder. There are selected filmographies for Hoffman, Lange, Murray and Pollack (even Columbia does not acknowledge Terri Garr, who was also nominated for a Best Supporting Actress Oscar�, although it was Lange who won). The subtitle collection comes in English, French, Spanish, Portuguese, Chinese, Korean and Thai, which appears de rigueur these days. A single-fold booklet describing a bit of backstory is included. I must take a moment here to mention the menu design: it is disgraceful. The buttons harken back to "Interactive Interface v1.0"—clunky, vacuform plastic effects; shiny and beveled and surely leftover from the stone age of digital graphics, when programmers were designers because real designers hadn't yet hopped the bandwagon. I know, I was there. It's a decade later, Columbia. Catch up. Dustin Hoffman pulls off the farce of the century...within this story, anyway. 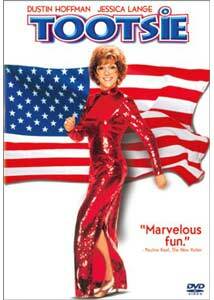 There is great dialogue dovetailed into this transparent script that elevates Tootsie above most others in its genre. Perhaps we were more gullible back in 1982; but a man posing as a woman who uses "her" masculine qualities to take on the feminist cause while falling in love with a "girlie-girl" just falls a little short, 20 years on.